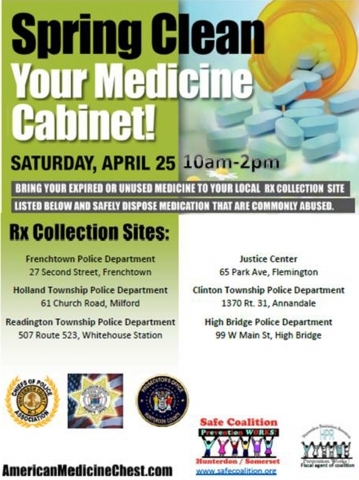 Area residents are being urged to spring-clean their medicine cabinets on April 25. Several collection sites are set up so that people can get rid of their unused, unneeded, or expired medications. The idea is to safely dispose of medications that are commonly abused. The collection is free and anonymous, and will be held from 10 a.m. to 2 p.m.
• Frenchtown Police Department, 27 Second St.
• High Bridge Police Department, 99 W. Main St. Items that will be accepted include prescription and over-the-counter solid medication like tablets and capsules, inhalers, ointments, nasal sprays and pet medications. Items that will not be accepted include injectables, needles, and illegal substances. People are asked to remove all personal information from the bottles. • 70% of people who abuse prescription pain relievers get them from friends and relatives. • 1 in 4 high school students have abused prescription drugs. • EPA studies have detected pharmaceutical drugs in the water supply. People with questions can call 908-782-3909, or visit http://www.safecoalition.org. The collection is supported by the Hunterdon County Chiefs of Police Association, the Hunterdon County Sheriff's Office, the Hunterdon County Prosecutor's Office, Safe Coalition of Hunterdon and Somerset, and Hunterdon Prevention Resources.